Welcome to the Bible Trivia Game created by the Foundation for the Advancement of Religion Online. 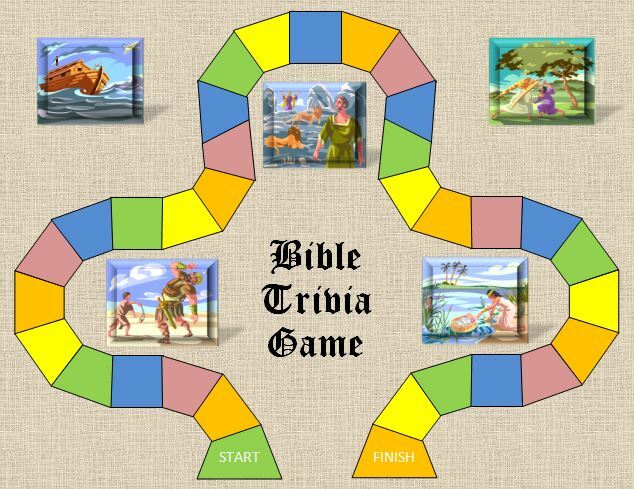 To give feedback, please go to http://www.religionresourcesonline.org/bible-trivia/bible-trivia-game. Preparation: Print Game Board, Trivia Cards, and Game-Play Cards (with game pieces). You can either cut the cards yourself, or take them to a printing company who will usually charge around $2 to cut all of them (if in a stack). Decide Levels: Before starting the game, look at a "Question Card" and as a group, choose what level each person should play at. To decide who plays first, go in order youngest to oldest. Shuffle the cards and put the "Game Play" cards on one side of the board and the "Trivia Cards" on the other side of the board. When it is your turn to play, select and read a your own "Game Play" card and have another player select a "Trivia Card" without showing it to you. That person will read the question according to the level the player is at and judge if the answer is correct. If the answer is close, be "merciful" and count it as a right answer. If you get the answer correct or incorrect, follow what the Game Play card says. If you get a questions wrong and there are no instructions for a wrong answer, you do nothing. Don't forget to follow the instructions on the game-board spaces. Have fun learning more Bible trivia!